City of Malolos - SP Secretary Ma. Perpetua R. Santos was invited as resource speaker for the 4th Legislative Skills Enhancement Training on Local Legislation (Legislative SETLLE) for the members of the National Movement of Young Legislators (NMYL) on two different occasions— the first was at the Grand Regal Hotel, Davao City held on August 1, 2014 and the second was at the City Suites Ramos Tower, Cebu City held on August 15, 2014. She talked on the topic “Managing the Day-to-Day Operations of the Sanggunian” wherein she discussed not only the mandated duties and responsibilities of the Sanggunian secretary, but also his/her management functions and his/her important tasks with regard to the legislative process. She also talked on the importance of having sufficient and efficient legislative support staff. She also discussed how the Legislative Tracking System (LTS) of the Sangguniang Panlalawigan of Bulacan works and demonstrated how she can access it remotely using the internet. The invitation for Sec. 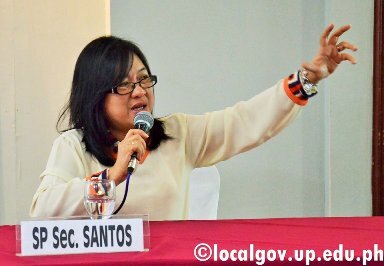 Santos to be a resource speaker was made by the Center for Local and Regional Governance (CLRG) from the University of the Philippines-National College of Public Administration and Governance (UP-NCPAG). Legislative SETLLE is a special course on local governance and public policymaking which the CLRG has been conducting for NMYL for the past eight years and aimed to equip young local legislators with the necessary knowledge and skills on legislation, the non-legislative functions of the Sanggunian and aspects of local governance that are of interest to legislative work. NMYL is an organization of young legislators aged thirty-five and below which include vice-governors, vice-mayors, board members and councilors. More than a hundred NMYL members participated to the said two Legislative SETLLE trainings.